Let’s get one thing out of the way: I have been eying the GreenBiz conference for years. 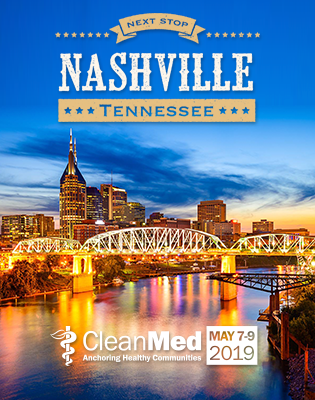 I was almost as excited to go to this event as I was for my very first CleanMed five years ago – almost. I was positively giddy getting off the plane in Phoenix. (Temps were in the 80s, which didn’t hurt when you’re flying in from blustery Ohio.) With courses like “Building a New Carbon Economy” or “How Climate Resilient is Your Company,” I couldn’t sleep the first night, even with a generous dose of NyQuil to battle my head cold. Yes, I was that kid in school, too excited to sleep. Imagine my added delight when the very first person I ran into at the conference was Sister Mary Ellen Leciejewski from Dignity Health. We went off for to our first course, Fundamentals of Corporate Renewable Procurement. We heard from experts in the field such as Microsoft, Iron Mountain, and Rocky Mountain Institute about the best practices and challenges of renewable energy procurement. I met someone from the World Wildlife Fund (WWF) who works with Renewable Energy Buyers Alliance, and we talked about the possibility of developing a health care working group. We headed off to an outdoor lunch to meet with our partners at Ceres, and luckily, Anne Kelly brought the sunscreen. P&G and International Paper modeled a transformative supplier-customer network built to help both organizations, as they put it, to “fall in love with problems” in order to find solutions. GM announced and explained their zero crashes, zero emissions, zero congestion goal. And Cristina Mittermeier brought the room to tears (including yours truly) with her moving photography and stories of her experiences at National Geographic and her desire to do more which led to starting Sea Legacy to use photography as a tool to inspire others. The final plenary was the perfect note to leave us on. It was a “We’re Still In” discussion with two of the organizations that have signed on – Ingersoll Rand and Microsoft – and the organizations behind the 1,000-plus signatories document addressing the desire to stay in the Paris agreement: Ceres and WWF. Millennials are driving this – from a consumer preference perspective and from a workforce perspective – and it’s time to listen. Plastic waste is a key issue, as companies like McDonald’s and Coca Cola declare a “war on waste” and work with the circular economy principles to solve it. Renewables are here to stay, and corporate buying power is how it will get done. This barely scratches the surface of what I learned, everything that inspired me, or the new connections I made. This conference was so overwhelming in the best way possible. There are people just like us working in other industries to make changes and to use the power of business to solve the biggest challenge our generation will face: climate change.